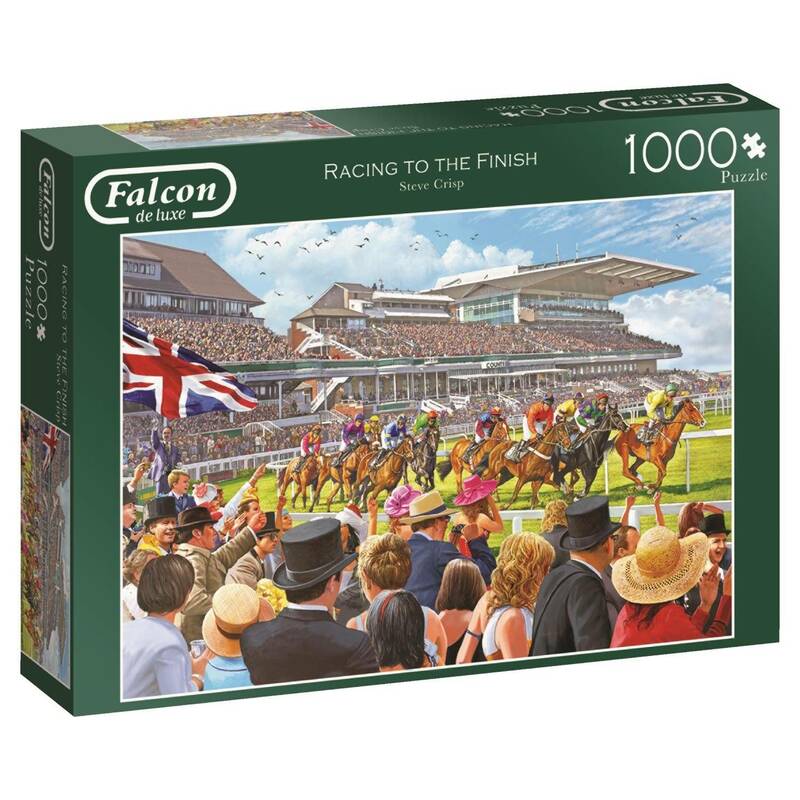 ‘Racing to the finish’ is the title of this stunning 1, 000 piece Falcon de luxe jigsaw puzzle, which is part of the Falcon de luxe animals collection. The puzzle image illustrates a striking scene of horses racing past the crowds at Cheltenham racecourse. 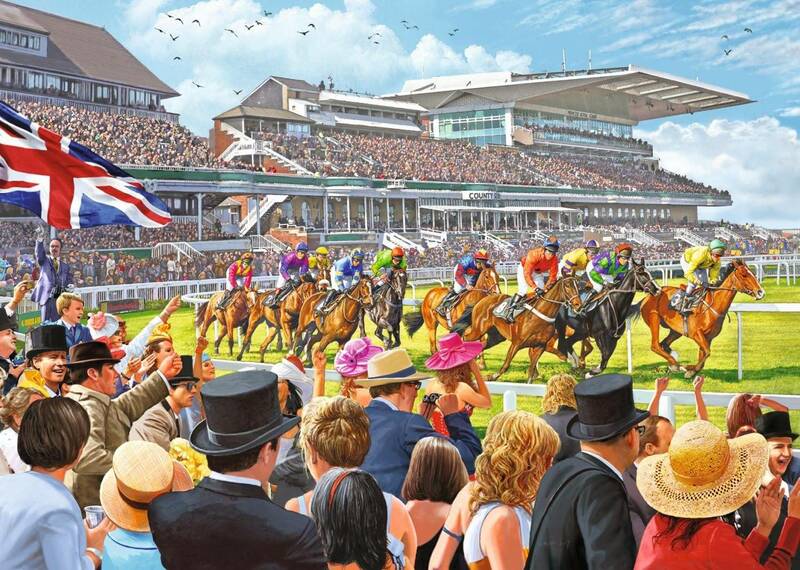 The painting sees the racecourse stands filled with thousands of cheering horse racing fans, as the ten jockeys push to be the first rider over the finish line. 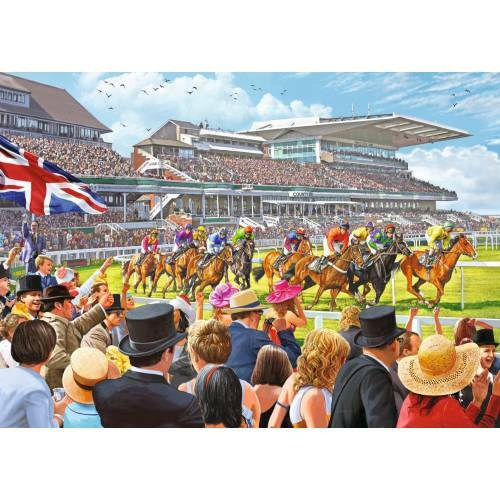 This is an ideal gift for anyone who enjoys a day at the races. This striking 1, 000 piece jigsaw puzzle has been illustrated by the very talented artist – Steve crisp. The finished size of the 1, 000 piece puzzle measures 68 x 49cm (approximately) and has been produced using a high quality cardboard to ensure every jigsaw piece maintains its original shape time and time again. Today’s Falcon de luxe puzzles are designed and crafted with the same passion for excellence that we have always had. They celebrate Falcon’s distinctive brand values of heritage and innovation. We choose only the most suitable illustrations for our jigsaws. We die-cut each jigsaw piece carefully, so when the jigsaw is completed, it looks more like a poster than a puzzle. Making jigsaws has always been, and will always remain, our passion.